Here is a song from 1929, mixing blues, Hawaiian music and variety, and typical of the versatility of legendary singer Jimmie Rodgers. Jimmie Rodgers (1897 - 1933), known as "The Singing Brakeman" and "America's Blue Yodeler", was the first country music superstar, a status that resulted in another commonly used nickname, "The Father of Country Music". He was born in Meridian, Mississippi. Jimmie's affinity for entertaining came at an early age, and the lure of the road was irresistible to him. By age 13, he had twice organized and begun traveling shows. Mr Rodgers found Jimmie his first job working on the railroad, as a waterboy. This is where he learned the cries and moans of the blues and was taught to pick and strum by the rail workers and the hoboes. A few years later, he became brakeman on the New Orleans and Northeastern Railroad, a position secured by his brother, a conductor on the line between Meridian and New Orleans. In 1924 at the age of 27, Jimmie contracted tuberculosis. The disease temporarily ended his railroad career, but, at the same time, gave him the chance to get back to his first love, entertainment. He returned to railroad work as a brakeman on the east coast of Florida at Miami, but eventually his illness cost him his job. He relocated to Tucson, Arizona and was employed as a switchman by the Southern Pacific. The job lasted less than a year, and the Rodgers family had settled back in Meridian by early 1927. Rodgers decided to travel to Asheville, North Carolina, later that same year. On April 18, Jimmie performed for the first time on Asheville's first radio station. A few months later Jimmie recruited a group from Tennessee and secured a weekly slot on the station as the Jimmie Rodgers Entertainers. In late July 1927, Rodgers' bandmates got word that a representative of Victor was coming to Bristol to audition area musicians. But, following an argument, the band broke up and Rodgers arrived at the recording session alone. 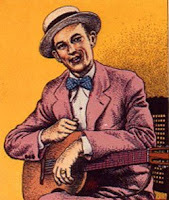 On August 4, 1927, Jimmie Rodgers completed his first session for Victor. In November, Rodgers headed to New York City in an effort to arrange another session. 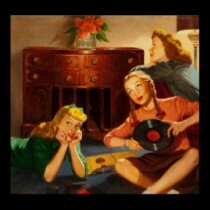 Four songs made it out of this session, including "Blue Yodel", better known as "T for Texas". In the next two years, this recording sold nearly half a million copies, which was impressive enough to rocket Rodgers into stardom. After this, he sold out shows whenever and wherever he played. 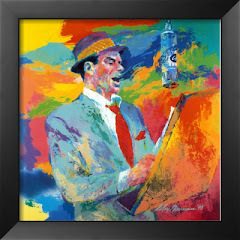 On July 16, 1930, he recorded "Blue Yodel No. 9" with jazz trumpeter Louis Armstrong, whose wife, Lillian, played piano on the recording. Rodgers's next-to-last recordings were made in August 1932 in Camden and it was clear that tuberculosis was getting the better of him. He had given up touring by that time but did have a weekly radio show in San Antonio, Texas, where he had relocated when "T for Texas" became a hit. In May 1933, Rodgers traveled again to New York City for a group of sessions. Those were the last ones. He died on May 26, 1933. He was 35 years old. When the Country Music Hall of Fame was established in 1961, Rodgers was one of the first three (with Fred Rose and Hank Williams) to be inducted. He was elected to the Songwriters Hall of Fame in 1970 and, as an early influence, to the Rock & Roll Hall of Fame in 1986. 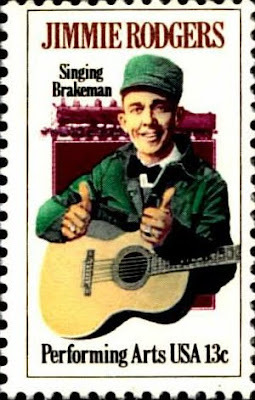 On May 24, 1978, the United States Postal Service issued a commemorative stamp honoring Rodgers. Since 1953, Meridian's Jimmie Rodgers Memorial Festival has been held annually during May to honor the anniversary of Rodgers' death. Rodgers' legacy and influence is not limited to country music. He was influential to a number of blues artists, among them Howlin' Wolf, whose howling was at the beginning an unsuccessful imitation of Rodgers' yodeling. Rodgers' mix of Southern white music and Southern black music was an important precurser to rock n' roll.